I am going to have a busy Christmas this time – no prizes for guessing why. Yes, the presence of a new born baby (who is a month old already by the way) ensures that her mother is always on her toes. One reason why I knew that blogging would not be so easy anymore. However, not wanting to disappoint my readers (and in turn myself) I tried out a few recipes well in advance this year. One of them was this lovely Christmas cake which fits the bill of being a non alcoholic fruit cake. I had bookmarked this recipe from a newspaper cutting last year and never got around to making it. This year I thought I must give it a shot. The fact that it made no use of alcohol to soak the fruits made it perfect for me . 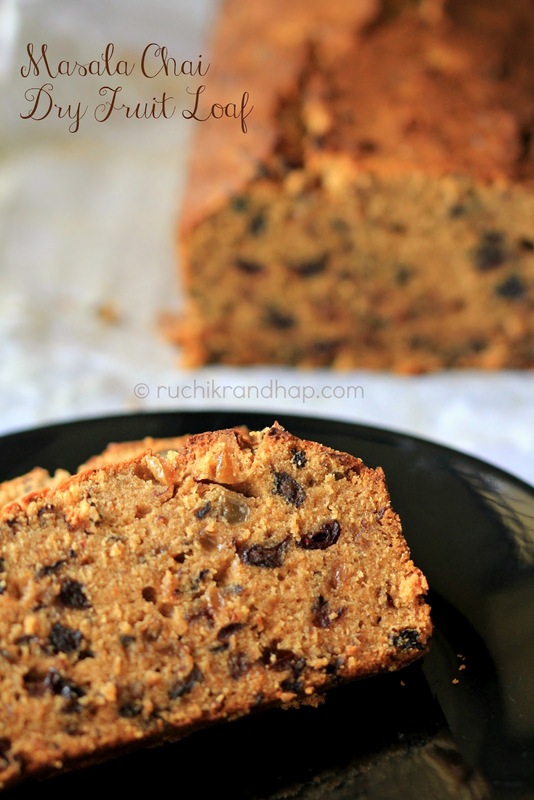 This cake makes use of tea instead of rum or brandy which is often used to soak the fruit days or months in advance. Our humble desi masala chai (tea) has become very fashionable in the West – people actually call it ‘chai tea’ which is nothing but masala tea or tea brewed with a bend aromatic ‘warm’ spices such as cardamom, cinnamon, cloves & dry ginger. Some spice blends include peppercorn, star and fennel too. Although not a tee teetotaler I took to drinking tea when I started working – there was a coffee vending machine at my workplace which had the yummiest masala tea which I loved to sip on every morning before I began my work and sometimes between breaks too. I am still loyal to coffee (I need my hot cuppa every morning to kick start my day) but I can easily replace my loyalties if I am presented with a cup of aromatic masala tea. 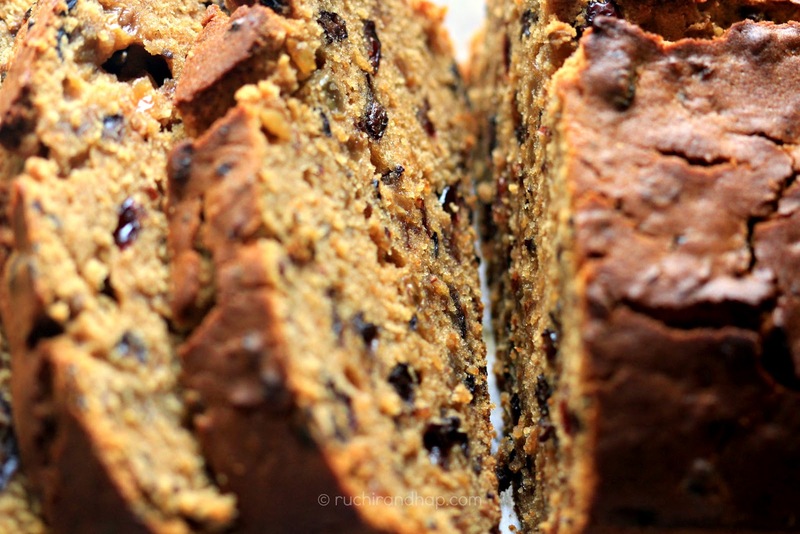 I made a lot of changes to the original recipe and the resultant cake was really impressive. It received thumbs up from our usual cake tasters (our family friends). The tea and brown sugar impart a lovely brown colour to the cake and it is fairly simple to make. As the cake happily bakes away the warm spices will fill your home with a lovely aroma that will put you in a wonderful Christmassy mood (time to play some Christmas carols to add to the mood!). 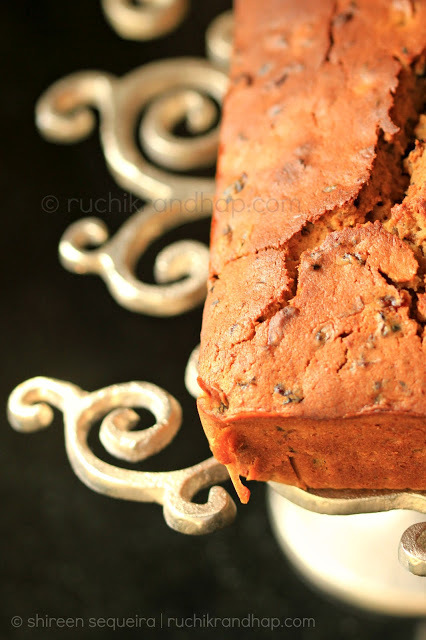 Rich, aromatic and moist – it has all the elements of a good Christmas cake. So perfect for those who love Christmas cakes sans the alcohol – I know a lot of people who like non alcoholic cakes due to religious and health reasons – so I hope you like it! 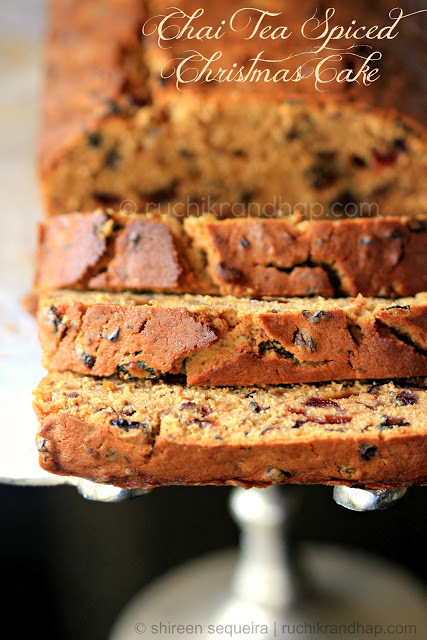 A must have fruit cake for those who love the chai flavour! Its subtle taste will win over many hearts! Clean the dry fruits, pick stems if any and roughly chop and place in a bowl. Measure the orange juice and add enough masala tea to bring the level up to 300ml. Pour this liquid over the dry fruits, add the zests of the orange and lime and give it a good stir. Cover and keep overnight. Grease and line a 26x13cm (10x5 inch) loaf pan with parchment paper. Preheat the oven at 160 C for 15mins. Sift the flour, baking powder, pinch of salt and dried orange peel powder and cinnamon powder (if using) twice and keep aside. In a large bowl, cream the butter and sugar well and add one egg at a time, beat well. Add the vanilla extract and mix. Sift the flour in parts and fold well to incorporate. Add the soaked fruits with the liquid and fold again. The batter should be of dropping consistency so if you feel it is a bit too thick and dry add a tablespoon of milk at a time and fold. Pour batter into the prepared tin and bake for 1 hour or until the skewer inserted comes out clean. Remove from oven and allow to cool on a wire rack/stand. Invert onto the rack after 15-20mins and allow to cool completely. Serve with whipped cream, ice cream or just plain with a nice hot cup of tea or coffee. You may use 150gm brown sugar instead of splitting between two types of sugar. Add an additional 2 tbsp to increase the sweetness - however, if you are using very sweet raisins or dates instead of cranberries then taste the batter before adding more sugar. I used dark muscovado sugar that gave a mocha colour to the cake. You may use regular white sugar for a pale coloured cake. 2. To make the masala tea boil 300ml of water and add 2tbsp tea powder and 1 tsp chai masala powder (I used Everest chai masala), let it brew for half a minute, allow to sit for a couple of minutes and then strain. If you have readily available chai tea bags you may use those as well - use as per desired strength of the tea. 3. Adjust the sweetness of your cake by using dry fruits that are less sweet - prunes, dried apricots and dried cranberries are a lot less sweeter than dates and raisins. 4. You can make your own dried orange peel powder by drying orange peels in the sun for 2-3 days. Powder in a dry grinding jar and store in an airtight container. Does this get better with age, like in traditional fruit cakes? Would love to make it. Thanks everyone for the lovely comments!! @ Unknown: This cake got wolfed down in 2 days, so I can't tell if it will keep too long (since there is no alcohol)or will taste better. It was just too delicious to be kept for days on end! Stunning christmas cake, beautiful slices. Thank you for the post, All the big stores are filled with Christmas season fruit cakes. This is an excellent "Hatke" one. Not a real baker myself, but I am going to try this for sure. Masala chai, Kya baat hai. Can I also suggest if you can pls put a pic or two of different stages of the recepe, like you mentioned the consistency of the batter,would help to see. You are doing an excellent job, even with a 2nd "chotu" around. Thanks, will make it soon. Hi Shireen I am surely making this recipe it looks delish thanks for sharing.